Charles III, the Fat was the youngest son of Louis the German and ruled as Emperor from 881 to 888. He was the last Carolingian to rule over a united empire. The re-unification however, would not last. During a coup led by Arnulf of Carinthia in November 887, Charles was deposed in East Francia, Lotharingia, and Italy. 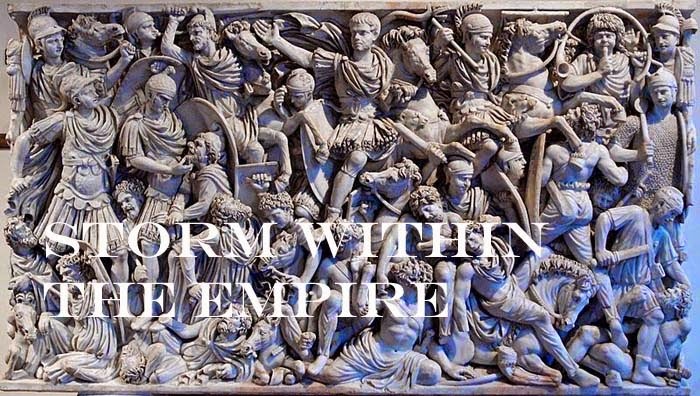 The Empire quickly fell apart after his death, never to be restored, with the Empire splintering into five separate successor kingdoms. Charles was the youngest of the three sons of Louis the German, first King of East Francia, and Emma, a Welf. In AD 859, Charles as Count of the Breisgau, became involved with his brothers in a series of revolts. In 863, his eldest brother Carloman revolted against their father, followed by Louis the Younger the next year. Charles joined Louis. In 865, the elder Louis was forced to divide his lands among his heirs: Bavaria went to Carloman; Saxony (with Franconia and Thuringia) went to Louis; and Alemannia (Swabia with Rhaetia) went to Charles. Lotharingia was to be divided between the younger two. In 876, Louis the German died and the inheritance went as planned after a conference at Ries, though Charles received less of his share of Lotharingia than planned. In his charters, Charles' reign in Germania is dated from his inheritance in 876. In 880, Charles joined Louis III and Carloman, joint kings of West Francia, in besieging Boso of Provence in Vienne from August to September but they failed to dislodge him. In August 882, Charles sent Richard the Justiciar, Count of Autun, to take the city, which he did (in September). After this, Boso could not regain most of his realm and was restricted to the vicinity of Vienne. Crowned Emperor on 12 February 881 there were hopes of a general revival in western Europe, but Charles proved unequal to the task. In February 882, Charles convened a diet in Ravenna with a goal to have Duke Guy of Spoleto restore stolen papal lands. In a letter to Charles, Pope John claimed that the vows went unfulfilled. In 883 Duke Guy, accused of treason made an alliance with the Saracens. Charles sent Berengar, equipped with an army, to seize Spoleto. Berengar, initially successful was forced to retire as an epidemic of disease struck all Italy. Defeated by Alfred the Great at the Battle of Ethandun in 878, the Great Heathen Army settled in the Low Countries. Louis III, Charles' brother, opposed them with some success, but he died after a brief campaign on 20 January 882. Charles succeeded to his kingdom and reunited the whole East Frankish realm again. When he had returned from Italy, Charles held an assembly at Worms with the purpose of dealing with the Vikings. The army of the whole of East Francia was assembled in the summer under Arnulf, Duke of Carinthia, and Henry, Count of Saxony. The chief Viking camp at Asselt was besieged and not long after Charles opened negotiations with them. The Viking chiefs, Godfrey and Sigfred, Godfrey accepted Christian baptism and Sigfred was bribed off. From 882 to 884, the Wilhelminer War dominated the Marcha Orientalis (later Austria). Arnulf of Carinthia, Charles's illegitimate nephew, allied with the rebel Engelschalk II against Charles' appointed margrave in the region, Aribo. Svatopluk I, ruler of Great Moravia, took up Aribo's cause and, in 884 at Kaumberg, took an oath of fidelity to Charles. Though the emperor lost his vassals of the Wilhelminer family and his relationship with his nephew was broken, he gained powerful allies in the Moravian dux and other Slavic duces in the area. In 885, fearing Godfrey and his brother-in-law, Hugh, Duke of Alsace, Charles arranged for a conference at Spijk near Lobith, where the Viking leader fell into his trap. Godfrey was executed and Hugh was blinded and sent to Prüm. Charles, childless by his marriage to Richgard, tried to have his illegitimate son by an unknown concubine, Bernard, recognised as his heir in 885, but met the opposition of several bishops. After the failure of his first attempt, Charles set about to try again. Charles met the new Pope Stephen V and probably negotiated for the recognition of his son as his heir. A planned assembly with the goal to confirm Charles ‘illegitimate son as heir had come to naught as the pope refused to attend. Matters came to a head in late 887. Family issues divided the household and his inner circle then began to fall apart. On 11 November, he called an assembly to Frankfurt. While there he received news that an ambitious nephew, Arnulf of Carinthia, had initiated a general rebellion and was marching into Germany with an army of Bavarians and Slavs. The following week his support in East Francia collapsed with the Alemanni being the last to leave him. By 17 November, Charles was out of power. Moving to Naudingen he died there six weeks later, on 13 January 888. The Empire fell apart, never to be restored. Arnulf desired the whole empire, but held East Francia and Lotharingia. Italy shuffled between three different claimants; Odo, Guy III of Spoleto, and Berengar. Louis was crowned in Provence, Burgundy went to Rudolph and in Aquitaine, Ranulf II declared himself king and took the guardianship of the young Charles the Simple, the Carolingian heir to the West. We take a look at the DBA III/28 Carolingian army list and how this can best be used to campaign the dynastic rivalries and regional rebellions. Louis the Younger (830/835 – 20 January 882), crowned Louis III] was the second eldest of the three sons of Louis II the German. He succeeded his father as the King of Saxony on 28 August 876 and his elder brother Carloman as King of Bavaria from 880 to 882. He died in 882 and was succeeded by his younger brother, Charles the Fat, already King of Italy and Emperor. As a young man, Louis was deployed in military operations against the Abodrites to the east in 858 and 862. In 854, at the invitation of the nobles of Aquitaine opposed to Charles the Bald and Pepin II, and coaxed by his father and his cousin Charles, Archbishop of Mainz, he crossed into Gaul at the head of an army, intent on receiving the crown of Aquitaine. He marched as far as Limoges before turning back. At home, Louis forged close ties with the nobles of the East Francia and became increasingly independent from his father. In 865, he and his brother Charles joined in rebellion against their father. The "revolt" was brief, however, and Louis, Charles, and their father were reconciled later that year. The division of territories was now made definite as Louis received Saxony, Thuringia, and Franconia and Charles Alemannia and Rhaetia. In 869, Louis married Luitgard, daughter of Liudolf, Duke of Eastphalia, at Aschaffenburg. Luitgard was a strong-willed and politically ambitious woman and later on spurred her husband to pursue ambitious goals. This match increased dissension between father and son and in 871 and in 873, Louis rebelled, but each time he was reconciled. Upon his father's death in 876, Louis fully inherited the title Rex Francorum ("king of the Franks"). 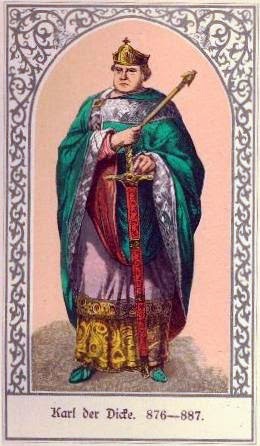 Louis the Younger considered himself the true heir of Louis the German and as his father died in 876, Louis buried him in the abbey of Lorsch, in his own territories, in order to emphasise his primacy to his brothers. Louis also retained his father's chief advisor, Luitbert, Archbishop of Mainz. He and his brother ruled their kingdoms independently but cooperatively. Louis's rule was immediately threatened by Charles the Bald, who tried to annex the eastern parts of Lotharingia and attempted to achieve supremacy over his nephew. Louis brought war on Charles and, on 8 October 876 at Andernach, he defeated the much larger host of West Francia. The East Frankish army displayed superiority in both unity and tactics, his soldiers dressed in white garments appeared as an army of dead spirits. After this victory, Louis the German's three sons met in November at Nördlingen to discuss the division of their father's kingdom and to have their hosts swear allegiance. According to the plan drawn up in 865, Carloman received Bavaria, Charles Swabia, and Louis Saxony, Franconia, and Thuringia. Throughout his reign, though Louis is always called "King of Saxony" by historians, he never visited Saxony proper, though it formed the bulk of his territory. At the end of 877, the brothers assembled again to discuss the administration of their half of Lotharingia. Following the death of Charles the Bald in November 878, his successor, Louis the Stammerer promised to respect the agreements made in 865 and 877. Known as the Treaty of Fouron, this was soon put to the test, when Louis the Stammerer died in April 879. A party of nobles and church dignitaries invited Louis the Younger to succeed to the rule of the western kingdom. Marching toward Verdun, the new kings Louis III and Carloman offered their part of Lotharingia to Louis. He retreated and in February 880, his gains were confirmed by the Treaty of Ribemont. This treaty determined the border of the two kingdoms that were to remain unchanged until the fourteenth century. Since the summer of 879, Vikings had been increasing their attacks on the Frankish kingdom and occasionally penetrated deeply into the interior of the land. Louis's kingdom was the most hard-hit after that of West Francia. In February 880, Louis confronted and defeated a Norse host at the Battle of Thimeon (near modern Charleroi) and drove the Norse out of Nijmegen. Despite these victories, a Saxon host commanded by Duke Bruno, suffered a heavy defeat near Hamburg. As Thimeon illustrates, no single military victory could stop the tide of Viking incursions. 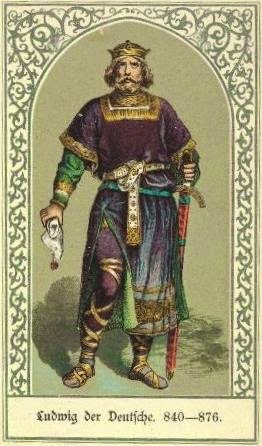 Louis fell sick in 881 and died in Frankfurt on 20 January 882. He was buried beside his father in the abbey of Lorsch. Since he left no heir, all his territories fell to his brother Charles, who thus could reunite the entire East Frankish kingdom. Louis was a grandson of Charlemagne and the third son of the succeeding Frankish Emperor Louis the Pious was made the King of Bavaria from 817 following the Emperor Charlemagne's practice of giving a local kingdom to a family member who then served as the local governor. The division of the empire by Louis I in 840 meant Louis II would be made King of East Francia. East Francia at this time has been covered in three earlier postings. Here, I will highlight his struggle to hold the kingdom together until his death in 876. When Louis I died in 840, Lothair claimed the whole Empire prompting Louis II to ally himself with the half-brother, Charles the Bald. At the Battle of Fontenay in June 841, Louis II and Charles were able to defeat Lothair. In June the following year, the three brothers met negotiate a peace, and arrange the boundaries of their respective kingdoms. The resolution, known as the Treaty of Verdun, confirmed Louis II holdings east of the Rhine (Eastern Francia), together with a district around Speyer, Worms, and Mainz, on the left bank of the river. His territories included Bavaria (where he made Regensburg the centre of his government), Thuringia, Franconia, and Saxony, hence the appellation of “the German”. Having in 842 crushed the Stellinga rising in Saxony, in 844 he brought the Obotrites to heel by putting their prince, Gozzmovil, to death. Thachulf, Duke of Thuringia, then undertook campaigns against the Bohemians, Moravians, and other tribes, but was less successful against the Vikings. Following unrest in Aquitaine, Louis II sent his son, Louis the Younger to secure the throne as the people of Aquitaine had enough of the misrule of Charles the Bald. After a number of futile attempts, Louis II supported by his nephews Pepin II and Charles, King of Provence, invaded Aquitaine in 858. Charles the Bald could not even raise an army (treachery and desertion) to resist the invasion and fled to Burgundy. 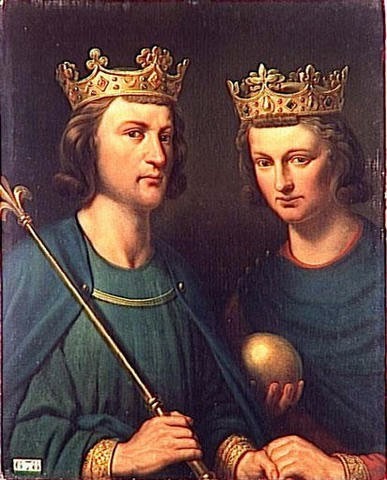 The later years of Louis the German were troubled by risings on the part of his sons, the eldest of whom, Carloman, revolted in 861 and again two years later; an example that was followed by the second son Louis, who in a further rising was joined by his brother Charles. In 864, Louis was forced to grant Carloman the kingdom of Bavaria, which he himself had once held under his father. The next year (865), he divided the remainder of his lands: Saxony he gave to Louis the Younger (with Franconia and Thuringia) and Swabia (with Raetia) to Charles, called the Fat. After taking Bari from the Saracens in 871, Louis was held hostage by Sergius of Naples, Waifar of Salerno, Lambert of Spoleto and Adelchis of Benevento. He was later released after swearing never to return to southern Italy. A report that the emperor Louis II (of Italy) was dead led to peace between father and sons and attempts by Louis the German to gain the imperial crown for Carloman. These efforts were thwarted by Louis II, who was not in fact dead, and Louis' old adversary, Charles the Bald. The Duchy of Saxony (Low German: Hartogdom Sassen, German: Herzogtum Sachsen) originally was the settlement area of the Saxons in the late Early Middle Ages, when they were subdued by Charlemagne during the Saxon Wars from 772 and incorporated into the Carolingian Empire (Francia) by 804. Upon the 843 Treaty of Verdun, Saxony was one of the five German stem duchies of East Francia. In 772 Pepin's son Charlemagne started the final conquest of the Saxon lands. Though his ongoing campaigns were successful, he had to deal with the fragmentation of the Saxon territories in Westphalian, Eastphalian and Angrian tribes, demanding the conclusion of specific peace agreements with single tribes, which soon were to be broken by other clans. The Saxons devastated the Frankish stronghold at Eresburg; their leader (Herzog) Widukind refused to appear at the 777 Imperial Diet at Paderborn, retired to Nordalbingia and afterwards led several uprisings against the occupants, avenged by Charlemagne at the (alleged) Massacre of Verden in 782. Widukind finally had to pledge allegiance in 785, having himself baptised and becoming a Frankish count. Saxon uprisings continued until 804, when the whole stem duchy had been incorporated into the Carolingian Empire. Afterwards, Saxony was ruled by Carolingian officials, e.g. Wala of Corbie (d. 836), a grandson of Charles Martel and cousin of the emperor, who in 811 fixed the Treaty of Heiligen with King Hemming of Denmark, defining the northern border of the Empire along the Eider River. Among the installed dukes were already nobles of Saxon descent, like Wala's successor Count Ekbert, a close relative of Charlemagne. Subdued only a few decades earlier, the Saxons rose to one of the leading tribes in East Francia. Liudolf's elder son Bruno (Brun), progenitor of the Brunswick cadet branch of the Brunonen, was killed in a battle with invading Vikings under Godfrid in 880. He was succeeded by his younger brother Otto the Illustrious (d. 912), mentioned as dux in the contemporary annals of Hersfeld Abbey, which however seems to have been denied by the Frankish rulers. Otto's position was further secured through marriage to Hedwiga of Babenberg, daughter of mighty Duke Henry of Franconia, princeps militiae of King Charles the Fat. As all of Hedwiga's brothers were killed in the Franconian Babenberg feud with the rivalling Conradines, Otto was able to evolve the united Saxon duchy under his rule. In 911 the East Frankish Carolingian dynasty became extinct with the death of King Louis the Child, whereafter the dukes of Saxony, Swabia and Bavaria met at Forchheim to elect the Conradine duke Conrad I of Franconia king. One year later, Otto's son Henry the Fowler succeeded his father as Duke of Saxony. According to the medieval chronicler Widukind of Corvey, King Conrad designated Henry his heir, thereby denying the succession of his own brother Eberhard of Franconia. In the 7th and 8th centuries, Frankish chronologies mention the northern Low Countries as the kingdom of the Frisians. This kingdom comprised of the coastal provinces of the Netherlands, from the Scheldt to the Weser and the German North Sea coast and further east. Known as Greater Frisia, the inhabitants spoke a common language. The 7th-century Frisian realm (650-734) under the kings Aldegisel and Redbad, had its centre of power in the city of Utrecht. Its ancient customary law was drawn up as the Lex Frisionum in the eighth century. Its end came in 734 at the Battle of the Boarn, when the Frisians were defeated by the Franks, who then conquered the western part up to the Lauwers. They conquered the area east of the Lauwers in 785, when Charlemagne defeated Widukind. The Carolingians laid Frisia under the rule of grewan, a title that has been loosely related to count in its early sense of "governor" rather than "feudal overlord". This Frisia Magna was partly occupied by Vikings in the 840s, until they were expelled between 885 and 920. I am of the opinion the Vikings did not conquer Frisia, but settled in certain parts (such as the island of Wieringen). From these locations they continued their trade with the native Frisians. Originally an eastern frontier march of the Merovingian kingdom of Austrasia (631) it was elevated to the status of duchy during the Carolingian era; its dukes being appointed by the king until it was absorbed by the Saxon dukes in 908. Known as the limes Sorabicus, or Sorbian March, in 849 it was placed under a duke named Thachulf. In the Annals of Fulda his title is dux Sorabici limitis, "duke of the Sorbian frontier", but he and his successors were commonly known as duces Thuringorum, "dukes of the Thuringians". As duke, Thachulf had military command over the counts with lands bordering the Sorbs. According to the Annales Fuldenses, in 858, a Reichstag held at Frankfurt under Louis the German sent three armies to the eastern frontiers to reinforce the submission of the Slavic tribes. Carloman was sent against Great Moravia, Louis the Younger against the Obodrites and Linones, and Thachulf against the Sorbs, who were refusing to obey him. The armies of Carloman and Louis set out in July, but it is uncertain if Thachulf ever undertook a campaign, as the Sorbs rose in rebellion late in that year and do not appear to have been restless beforehand. Thachulf died in the summer of 873 which was immediately followed by the revolt of the Sorbs, Siusli, and their neighbours. The revolt was not put down until Liutbert and Radulf, Thachulf's successor, campaigned in January 874. In 880, King Louis replaced Radulf with Poppo, perhaps a kinsman. Poppo instigated a war with Saxony in 882 and in 883 he and his brother Egino fought a civil war for control of Thuringia, in which the latter was victorious. Sorbs arrived in the area extending between the Bober, Kwisa, and Oder rivers to the East and the Saale and Elbe rivers to the West during the sixth century A.D. In the North, the area of their settlement reached Berlin. The earliest surviving mention of the tribe was in 631 A.D., when Fredegar’s Chronicle described them as "Surbi" and as under the rule of a Dervan, an ally of Samo. The Annales Regni Francorum state that in 806 A.D. Sorbian Duke Miliduch fought against the Franks and was killed. In 840, Sorbian Duke Czimislav was killed. In 932, Henry I conquered Lusatia and Milsko. Gero II, Margrave of the Saxon Ostmark, reconquered Lusatia the following year and, in 939, murdered 30 Sorbian princes during a feast. As a result, there were many Sorbian uprisings against German rule. A reconstructed castle, at Raddusch in Lower Lusatia, is the sole physical remnant from this early period. The Duchy of Franconia emerged from the partitioning of Austrasia in 817. 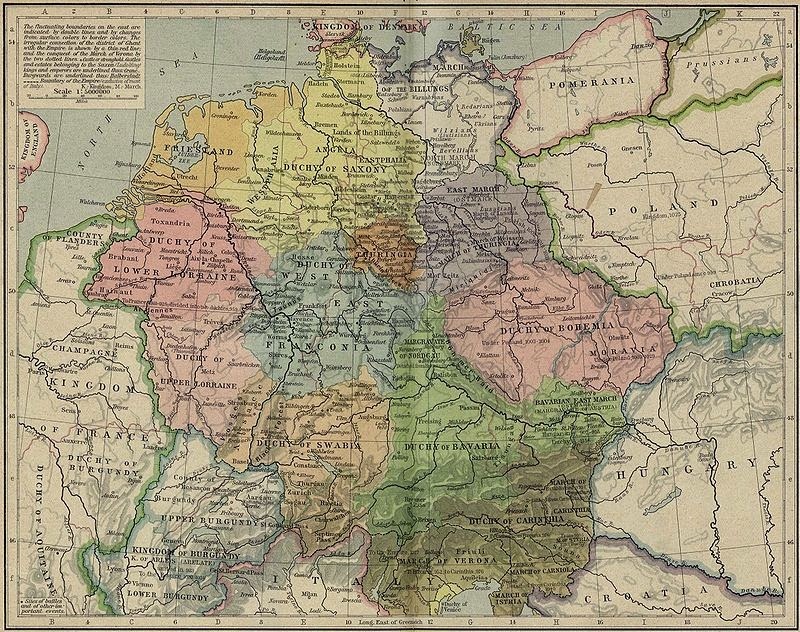 By comparison to the Duchy of Bavaria, Franconia was mere collection of large estates controlled by counts. To describe it as colonial would not be too far from the truth as many areas still followed pagan practices. One of the five Stem Duchies of East Francia, it stretched along the valley of the River Main from its confluence with the Upper Rhine up to the Bavarian March of the Nordgau, in the areas of the present-day Bavarian region of Franconia, the adjacent southern parts of the Free State of Thuringia, northern Baden-Württemberg (i.e. 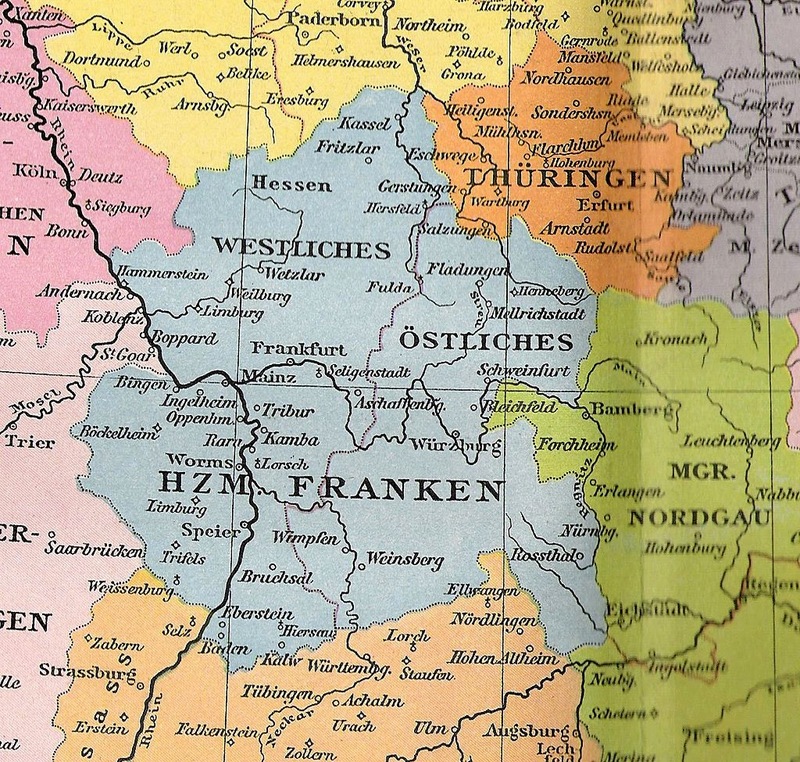 Rhine-Neckar and Heilbronn-Franken) and Hesse. It also included several Gaue on the left bank of the Rhine around the cities of Mainz, Speyer and Worms comprising present-day Rhenish Hesse and the Palatinate region. Located in the centre of what was to become the German kingdom about 919, it bordered the stem Duchy of Saxony in the north, Austrasian Lorraine (Upper and Lower Lorraine) in the west, the Duchy of Swabia in the southwest and the Duchy of Bavaria in the southeast. Next, the northern region of East Francia. Prof. T. Reuter in his book Germany in the Early Medieval Ages 800 – 1056 describes the Treaty of Verdun (843 AD) was not so much a negotiated peace settlement but merely an armistice as hostilities resumed after a few years of “peace”. The treaty did define the distribution of the former Carolingian empire among the three sons. Of those three, this project will focus on East Francia and its transition from kingdom to empire. To gain a better appreciation of this, it would be best to look at the three major regional areas that made up the eastern kingdom and how each influenced the political and military climate of the whole. These are the southern region of Bavaria, Thuringia and the Carinthian march, the central region of Franconia and the march lands to the east and last the northern region of Saxony, Frisia and the march lands facing the Wends. The southern lands had a long established aristocracy coupled with the strong presence of the Church, albeit a German and less Roman. Trade routes running along the Danube and south to Italy gave Bavaria a strong central position within the East Frankish empire. Tracing its origins from the mid-6th century, the duchy of Bavaria stretched to lands held by Swabian, Bavarii and Frankish tribes. The ruling house throughout most of the first period was the Agiloffings and through a succession of able leaders expanded their domains beyond the Bohemian Forest in the east and to northern Italy upon the departure of the Lombard tribes. To secure their hold, the aristocracy encouraged the Christianization of newly won territories while supporting an ever expanding number of Dioceses throughout the kingdom. Together, the aristocracy and church were able to establish policies to secure the steady succession of the ruling house and weather the recurring raids by the Avars. This all changed when the Carolingians came to power. The last duke, Tassilo III, could not stop Charlemagne’s incorporation of the kingdom into the Frankish Empire. The absorption of Bavarian meant administration would be done by Frankish prefects. Under Louis the Pious (Emperor) divided the empire, Louis the German was given Bavaria (817) but did not begin governing until 825. 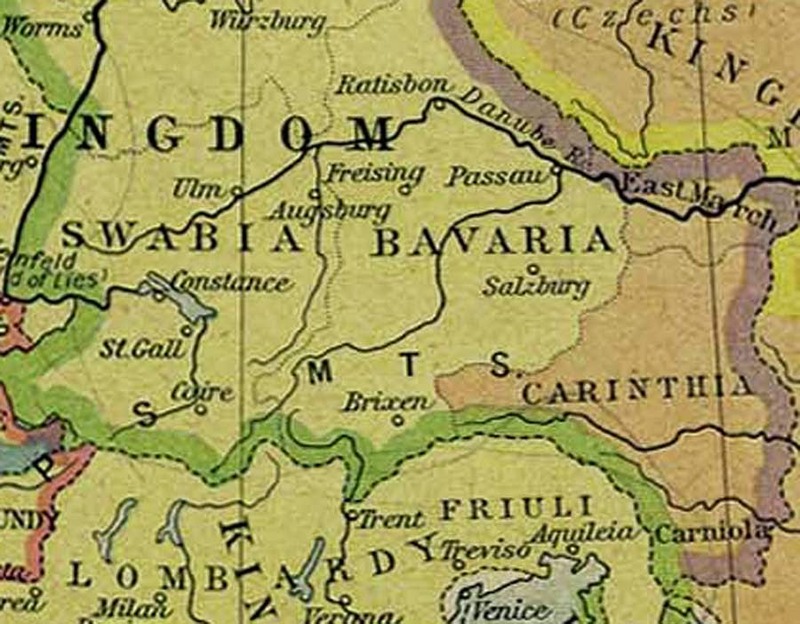 In 828 by Imperial Decree, “Avaria” or the March of Pannonia was set up as a frontier bordering the Bavarian realm. Meant to offset the rise of the Moravian threat under Mojmir I, the marchland area came under East Frankish rule in 843 as part of the treaty resolution. During this period during a series of civil wars (832, 839, 840), Louis expanded his domains by wresting control over Alemannia from his half-brother Charles. Over the years, the Moravian threat would continue and in 856, Louis ceded the Pannonian march to his son Carloman of Bavaria. His first priority was to strengthen the fortifications along the Traisen River and build a castle at Tulln (859) on the Danube. Upon the death of Louis the German (876), Carloman succeeded him as East Frankish king. Rule of Lower Pannonia then passed on to Arnulf of Carinthia. Next, a look at the growth of the Central and Northern regions followed up by developing some historical scenarios.